This comical Easter bunny seems to be having some difficulty finding his way to the annual Easter egg hunt. However, he’s getting plenty of help from the locals hanging out at the corner street sign. Perched at the highest point with the best view of the surrounding area, Mr. Bluebird flaps a wing and points toward Easter Avenue. 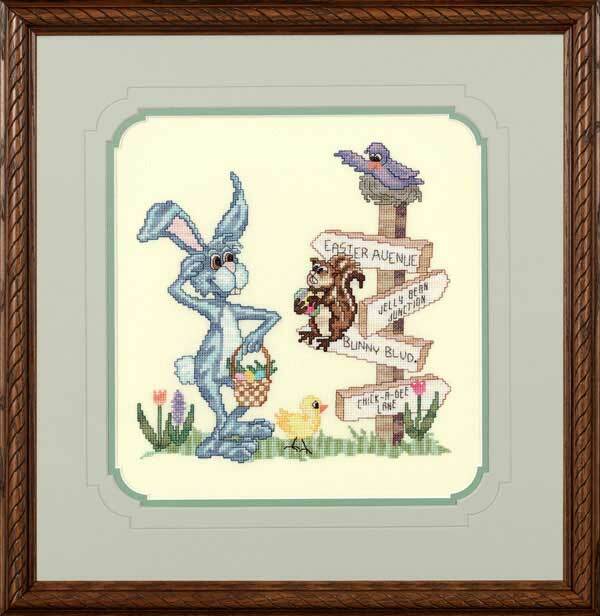 Enjoy stitching this bright, cheerful, colorful scene and adding it to your Easter décor. Fabric: Stitched on 28 count Ray of Light Lugana (Item #3270/203) by Zweigart. Materials Summary: A total of 26 colors of Weeks Dye Works and 7 colors of Anchor floss used in model. DMC comparable (best match) colors are provided in chart in lieu of Anchor. Weeks Dye Works is a variegated floss and there are no comparables.